The FG4000 magnetic flow meter is primarily designed for a wide range of industrial applications. Flow is determined on the electromagnetic induction principle that allows measuring it without any mechanical parts in the metering profile, which results in virtually no pressure drop. The FG4000 flow meter is a highly reliably instrument that offers accurate flow measurement in liquids at long-term stability. This flow meter further features awide flow range while maintaining measurement accuracy with fast response to flow fluctuations. An alphanumeric display and three membrane keys provide comfortable operation. Last but not least, accent is put on design user-friendliness, such as easy access to the connectors. 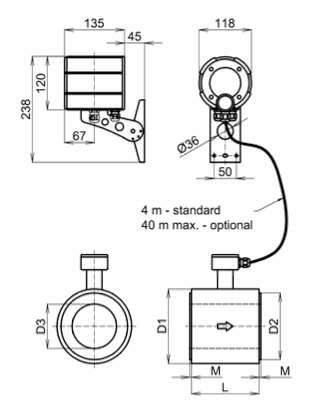 The flowmeter consists of two main parts, a measuring unit and a flow sensor. The measuring unit is housed in a rigid aluminium casting that allows four positions of the flowtube in a horizontal or vertical pipe line while the correct operation position of the stainless steel front panel with display and membrane keys is always provided. The FG4000 flow meter advanced industrial design satisfies stringent requirements for mechanical as well as chemical resistance thus allowing to use the instrument under most rigorous conditions. The flow meter has ingression rating IP67 while its increased resistance against electromagnetic interference in compliance with category E2 pursuant to EN ISO 4064-5 may be stressed. The FG4000 measuring unit allows you to connect a wide range of electromagnetic sensors from the most commonly used flanged, sandwich, threaded, food grade to customized versions, limited only by the dimensions given by the technical possibilities. 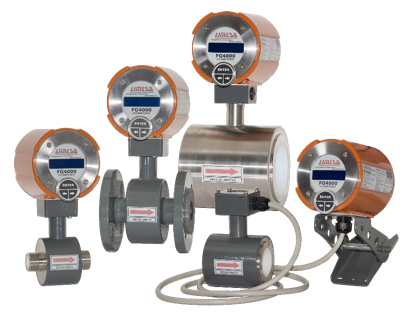 Integration of flowmeters into third-party extension systems, such as control, visualization and other systems, is enabled by standard pulse or analogue outputs. For a more sophisticated systems, the communication interface with open MeterBUS, RS485 (ModBUS, BitBUS, ASCII, simple), RS232 (ModBUS, Simple) protocols is determined. The flowmeter can be equipped with an empty pipe detection function. This function is for cases where the permanent flooding requirement of the sensor can not be met. The measuring unit is also available as an ECONOMIC variant (without the display and keypad). 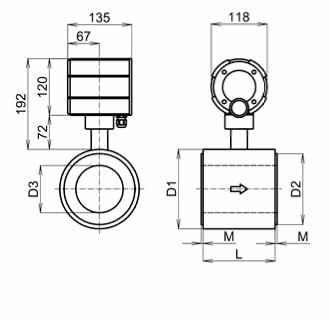 This option is for applications where the flowmeter only serves as a flow and volume variable to the parent system.